The Aanderaa Real-Time enabled devices like the Seaguard® Platform, and the Aanderaa smart sensors form the basis of this system. All Aanderaa Real-time system use XML to carry the information. The XML message is transmitted in an envelope that provides information for error detection and retransmit mechanisms. 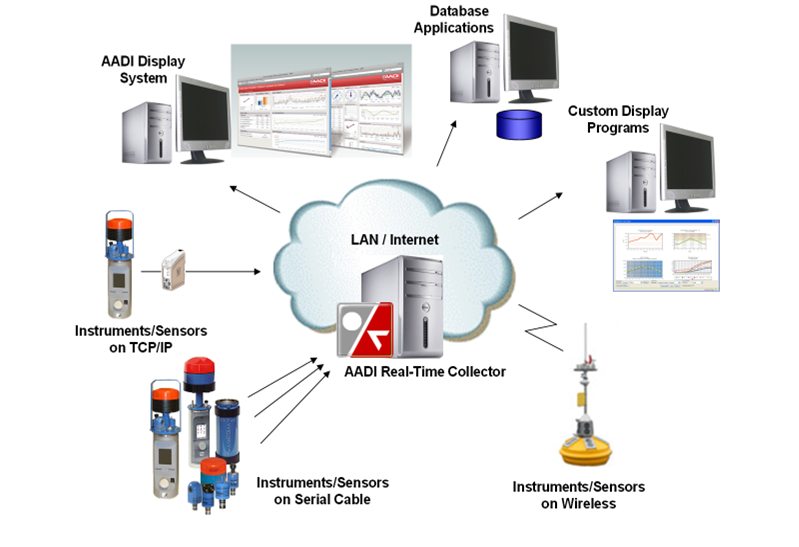 Aanderaa Real-Time Collector is an application that connects to the Aanderaa Real-Time enabled devices. Aanderaa Real-time Collector receives transmitted data and provides a powerful interface for easy and efficient access to the data from higher level applications like display programs, databases etc. Supports connection to multiple devices (instruments and sensors). Provides multiple clients with data from any of the connected devices. Converts old Aanderaa and 3rd party one-line based sensor formats to the Real-Time Output XML format. Built-in control panel to control and configure devices that support the Real-Time Control protocol.